Could this possibly be spring? It’s certainly a nice change from snow and freezing temperatures, so a denim boiler suit styled for a rainy spring day was the perfect solution this weekend. 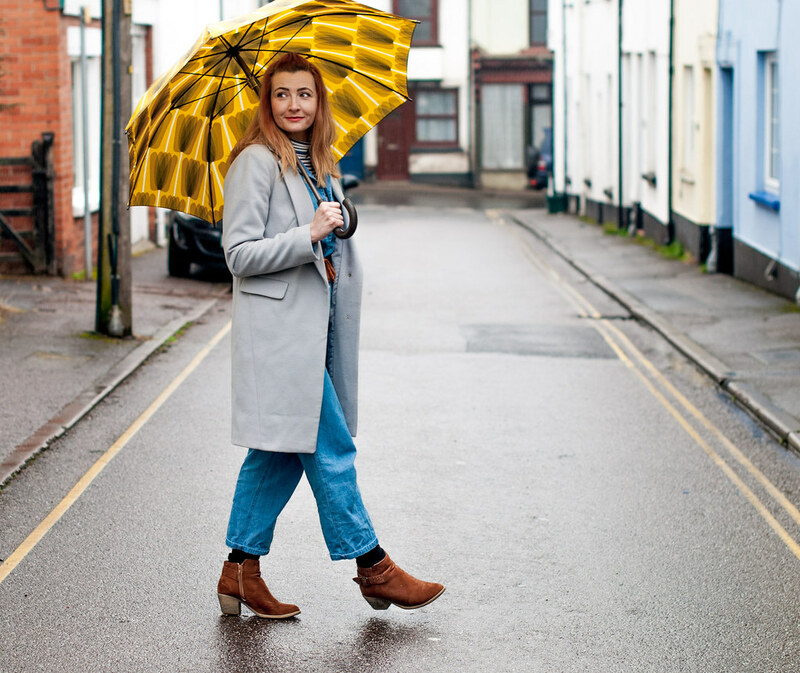 Aaaanyway – this is what I wore into town: a super-practical, rainy day in spring outfit. 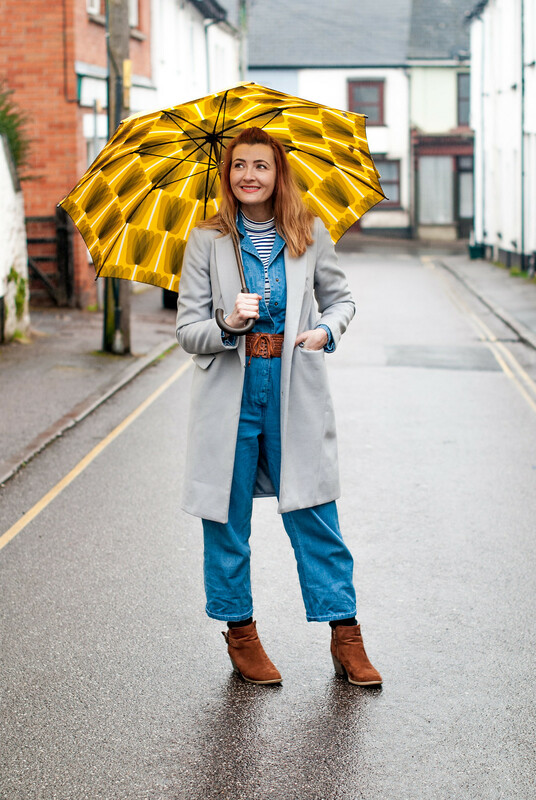 It was totally inspired by this outfit worn by the lovely Carelia – an outfit that I’d had in mind for a while since seeing her boiler suit/grey coat combo back in January. I loved the glittery heels with it, but I made it work for me by swapping heels for comfy ankle boots and adding a chunky tan belt to match. For once it wasn’t actually cold enough for hat and gloves (about flippin’ time too!) 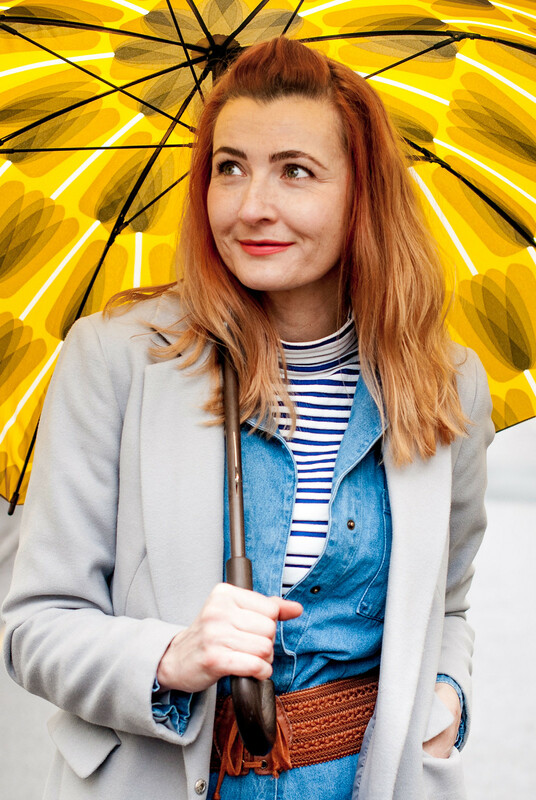 so because of the rain I grabbed my yellow umbrella (I think it was an Orla Kiely design?) which adds that gorgeous burst of colour to the photos as well as the outfit. I’m inspired by loads of Carelia’s outfits – she’s petite and has a completely different body shape to mine but I don’t think them not looking like you should stop you considering others’ outfits to emulate when looking for style inspo. I never take any notice of someone’s body shape, height or age when looking at outfits – if I like it, I pin it. Then I switch up the bits that don’t work for me and keep tweaking until it looks like “me”. It was Carelia’s take on her boiler suit that caught my eye: a striped Breton top underneath and a grey duster coat on top. I needed another way to wear my boiler suit after wearing it in the summer and still not look like I’m about to get under the car to mend it. However, that didn’t stop my dad saying Have you come to work on my car today? which I followed up with rolled eyes and a smile. I think he knows me well enough to know by now I’ll wear anything I like, and if that includes motor-mechanic chic then so be it…! WHO (OR WHAT) HAS BEEN INSPIRING YOU LATELY? TELL ME IN THE COMMENTS…! 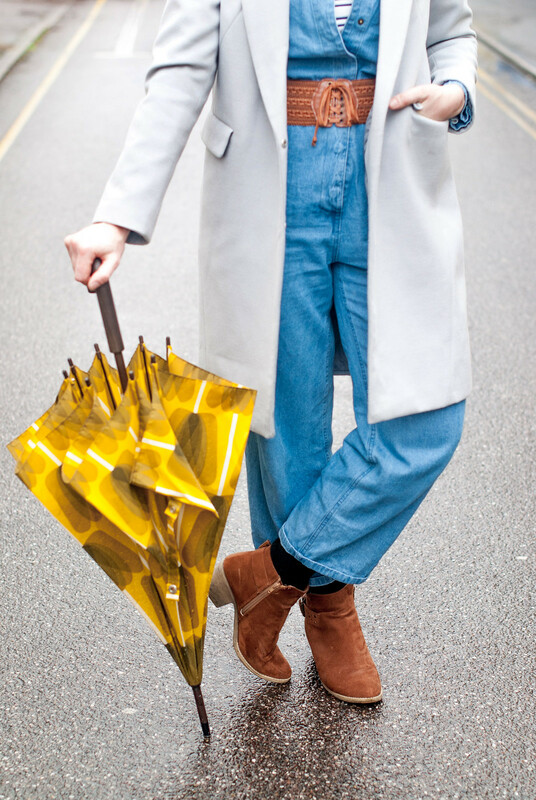 Lovely boiler suit with yellow popup, umbrella. Lovely classic styling for spring or rainy weather,. Looking so pretty Catherine in all photos. And that umbrella is beautiful. Perfect outfit for Rainy days in spring. You are looking adorable Catherine. You just look so pretty in these photos Catherine and I absolutely love the jumpsuit! I can’t wait to read your interview with Twiggy! Thank you so much for the link up. 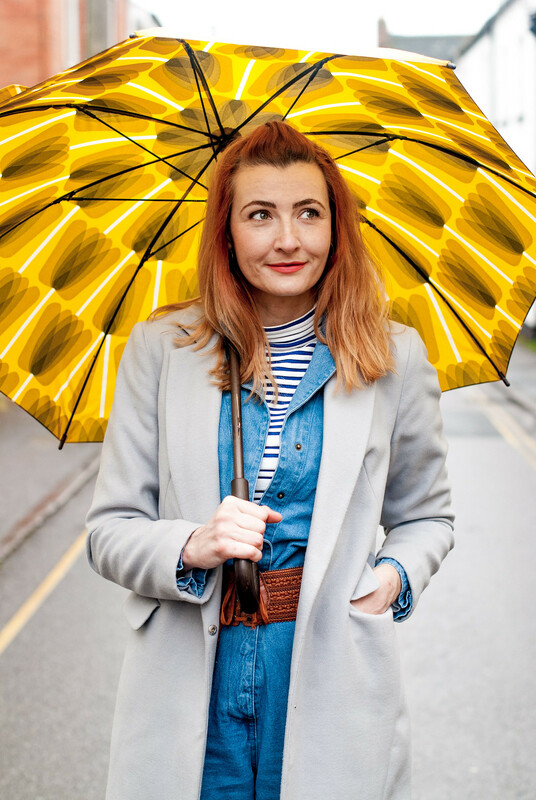 This outfit is almost neutral for you, but love how you’ve kept it bright with your umbrella! Good luck on the closing of your house! You are ADORABLE in this jumpsuit/boilersuit/all-in-one-thingimigigy! I love the layering and would wear the whole lot quite happily. I’m feeling it from some of the “street style” images I’ve seen. Especially colour combinations like all over pastels. P.S I love how different that grey coat looks compared to the orange scarf look, which I am still in love with! Dear Catherine, this blog post has made my day. I feel extremely honored to know that a stylish lady like you is getting inspired by my looks. This is my main motto as a blogger – to inspire others to have fun with their wardrobe. I couldn’t agree with you when saying that you don’t take any notice of someone’s body shape, height or age when finding inspiration – no one should. Catherine, I love how you recreated this look adding your own personal touch by incorporating color and weather appropriate accessories, by the way, your hair is looking long and full of youth. Such a cute outfit!! I love the blue and yellow together! Of course now I’m super careful about what I say to my kids & never “joke” about their choices which tbh can be pretty ropey at times. It’s how they express themselves & experiment with their style right? Your umbrella is perfect – cute Outfit! Great boiler suit (I love that name for these). And I admit, I think I need to carry a colourful umbrella with me always. I love that punch of colour, which brings out the outfit but also makes our skin look positively radiant! Thanks for the linkup. I absolutely LOVE boiler suits so needless to say this is GORGEOUS! I love the brolly too, Catherine! Super excited about your upcoming move. Cute look Catherine. Good luck with selling your house! well Boiler suit was a new one for me, was not sure what that actually would be.I love the phrases that we all use differently. Funny story when I was much younger and I mean much like 16-18, when I read Harlequin romances and they mentioned someone was wearing a jumper I always thought is was a dress, Never knew it was what we called a sweater or pullover for years. Now I have a new word Boiler suit, sounds way cooler then coveralls. I clocked the Orla brolly at 20 paces! 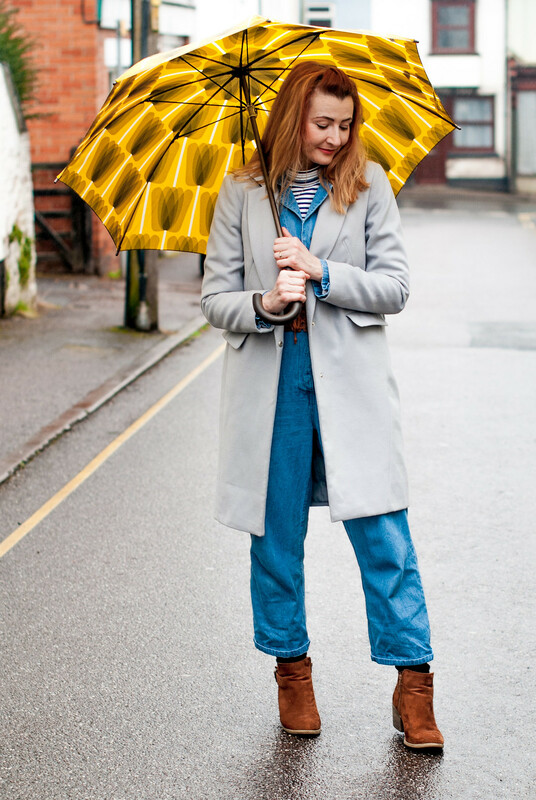 Another fab post Catherine, but I’m not sure which I love most – the boilersuit or the jazzy brolly! I can’t wait to read about your meeting with Twiggy. Now, there’s a lady who has kept her style credentials in very good nick over the years! Have a brilliant week, and thanks for the link up party. So happy that’s it’s spring although the weather here is not quite yet spring! This adorable outfit though is perfect for a rainy spring day! Love the way it’s layered and that umbrella is amazing! Oh that umbrella brella brella is fabulous. Oh my goodness, Catherine, you are so adorable in this easy casual rainy day outfit! I love it! Love the jumpsuit! I spotted a denim one in Mango the other week. It’s calling me! I will most probably have to cut a good foot off though! Looking fantastic Catherine. Dad’s just don’t get the style thing, do they, Catherine?? But they still are wonderful and make us giggle!!! That umbrella is super cute! The location of this outfit shoot is perfection.